Tween Tuesday is a weekly meme to highlight great reads for Tweens! 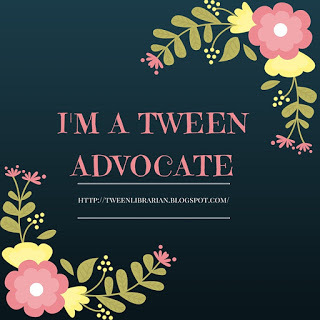 Leave your own Tween Tuesday post link in the comments below! About the Book: Vita decides she wants to form a band, but first she needs members-and they have to learn to play instruments. Vita recruits band members at her school and they decide to put on a concert. When the band learns that fellow member, Tanya, has leukemia, the band decides to change their concert to a fundraiser for cancer research. GreenBeanTeenQueen Says: The good thing about Zebrafish is that it’s never overly preachy about doing good. The characters are diverse and I’m sure readers will find someone to relate to. Tanya’s illness is touched on, but this is not a cancer book. This is more a story about finding friends and putting your talents to work for a good cause. Because there are a lot of main characters, you never really get to fully know each character and I would love more back story about each of band members. That was my main gripe with the book-I didn't feel like we really got to know the characters very well and I felt there was so much going on, there was a lack of true character development. 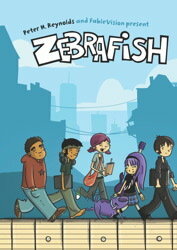 I’m glad to know there will be another Zebrafish book coming, so hopefully we get to know the band more. Even though the story deals with some hard topics, the book never feels weighed down by that storyline, which I think will give it lots of appeal for readers who want a realistic story that’s not issue-heavy. The artwork is bright and colorful and will appeal to fans of comics and graphic novels. I would give this one to tweens looking for a realistic fiction comic book and it would be a great book to start a discussion about fundraising and volunteering. I don't much like preachy books, so I'm sure kids won't either. Glad to hear this one wasn't. Here's my Tween Tuesday post. Sounds like an interesting story for a comic/graphic novel. Here's my Tween Tuesday post. Sounds interesting. I hadn't seen this one before. I think it's hard to find books MG that deal with series things but don't fall into being too preachy.